Sanjay Kumar is a professor and currently director of the Centre for the Study of Developing Societies. The views expressed are personal. The argument against holding simultaneous elections on the ground of having its impact on the federal character is even stronger. The idea of holding simultaneous elections could be compared with the big elephant which has two kinds of teeth - one, the trunks, which are beautiful, a good showpiece to keep in drawing rooms, and the other, which are inside the mouth used for eating, which we don't see. The argument for holding simultaneous elections to save money, which draws large support from people, could be compared with the trunk of the elephant, which everyone likes. But we fail to analyse the fallout of holding simultaneous elections for the Lok Sabha and state Assemblies, just like while appreciating the trunk we fail to see the inner teeth of the elephant. There are dangers of India moving from a federal to a unitary form of government if elections are held simultaneously. The smaller regional parties will be at the receiving end. This is the inner teeth that we fail to see: simultaneous elections will definitely save some money but the price we might pay will be enormous -- losing the federal character of the country, an important feature for the development of different regions of India. While the issue of holding simultaneous elections is yet to be debated carefully, I am happy to note that the proposal seems to have received a setback on the grounds of "feasibility", at least till the next Lok Sabha polls in mid-2019. Reacting to recent news reports about the possibility of holding elections in at least 11 states along with the Lok Sabha polls, chief election commissioner O.P. 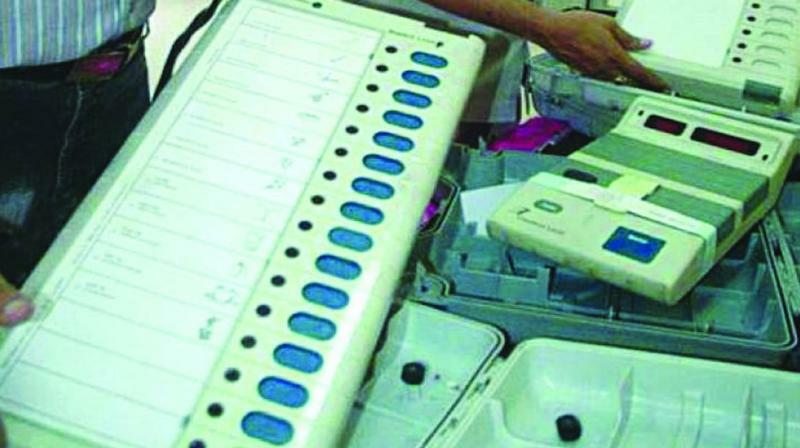 Rawat, citing constitutional, legal and logistical difficulties (such as VVPAT, EVMs, availability of police forces and polling personnel) has made it clear it may be extremely difficult to hold simultaneous elections for the Lok Sabha and 11 Assemblies in May 2019. He also spelt out that it would be impossible to hold these polls if the Lok Sabha elections due in 2019 is advanced to late 2018, to be held along with Assembly polls in Rajasthan, Madhya Pradesh, Chhattisgarh and Mizoram, which are due by late December. Given the existing constitutional provisions, there is hardly any possibility of postponing the Assembly elections in the four states due in December 2018. At least the idea of simultaneous elections does not seem to be feasible till the 2019 Lok Sabha elections. At best, the Assembly elections in a few more states (Maharashtra, Jharkhand and Haryana) could be clubbed along some others (Andhra Pradesh, Arunachal Pradesh, Odisha, Sikkim and Telangana) which fall in the natural cycle of having simultaneous polls along with the Lok Sabha elections by advancing the Assembly elections in these states. There is, of course, no harm in holding elections to state Assemblies along with the Lok Sabha polls if the election cycles are the same and even in clubbing a few states along with the parliamentary elections even if these were due in those states a few months later, but making it mandatory by law to hold elections for all Assemblies along with the Lok Sabha seems to be an idea which is neither desirable nor feasible. The argument against holding simultaneous elections on the ground of having its impact on the federal character is even stronger. There is clear evidence from past elections to prove that in many instances, voters tend to vote for the same party for the Lok Sabha and state Assemblies when the elections are held together. It's more a rule than an exception. Since the 1989 general elections, there have been 31 cases of simultaneous elections for state Assemblies and the Lok Sabha -- Andhra Pradesh (1989, 1999, 2004 and 2014), Odisha (2004, 2009 and 2014), Karnataka (1989, 1999 and 2004), Sikkim (2009 and 2014), Tamil Nadu (1989, 1991 and 1996), Maharashtra (1999), Assam (1991 and 1996), Haryana 1991 and 1996), Kerala (1989, 1991 and 1996), Uttar Pradesh (1989 and 1991), West Bengal (1991 and 1996), Arunachal Pradesh (2009 and 2014) and Telangana (2014). When elections were held the same day to elect MLAs and MPs, in 24 of these 31 elections, voters voted in more or less similar manner -- the dominant party polled more or less similar votes in both the Assembly and Lok Sabha elections. Only in seven instances, the voters were able to make a clear distinction between the Assembly and Lok Sabha elections, and voted differently. Voters were able to make such a distinction only in states where regional parties are very strong, such as Tamil Nadu and Andhra Pradesh. Regional parties manage to get decent votes in the Assembly elections but not for the Lok Sabha. The fear is that if elections for the Assembly and Lok Sabha are held the same day, the regional parties may get further marginalised as a large number of voters might tend to vote for the same party in both the Assembly and Lok Sabha elections. There is no denying the fact that holding simultaneous elections would reduce the government's expenses on the conduct of elections, but this would hardly help to reduce the expenses incurred by the candidates and political parties, which is the biggest part of election expenses. The logic of the government not being able to function properly due to frequent elections seems to be a weak argument as the model code of conduct is in operation only for a few months, and nothing prevents governments from carrying out development work for remaining part of their term. India is one country, but we must recognise the existence of 29 states, with each having its own elected government, given the constitutional division of power. It gives the country a truly federal character. But simultaneous elections would slowly and gradually hurt these smaller regional parties, and we might see them disappearing from the political scene. The regional parties are the symbol of the expression of regional aspirations and issues relating to marginalised people, who have felt left out of the country's development process. Studies have indicated smaller regional parties get more votes from marginalised communities such as dalits, adivasis and OBCs, so the disappearance of the smaller parties would mean the virtual disenfranchisement of the marginalised sections of Indian voters.